Preheat oven to 85°C/185°F. Season the pork neck all over with salt and pepper. Halve the onions, roughly chop carrots, and crush most of the garlic cloves. Heat a large pot over medium-high heat. Add vegetable oil, then sear the pork shoulder on all sides, approx. 2 min. per side. Add the cumin seeds, vegetables, and dark beers. Bring to a simmer, then cover and transfer to the oven. Bake at 85°C/185°F for approx. 6 hrs., until pork is completely fork tender and cooked all the way through. 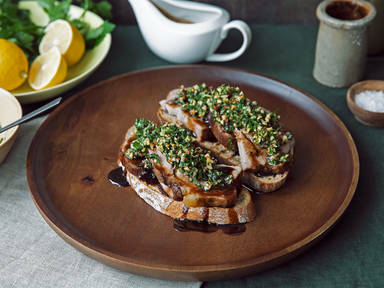 Once the pork is cooked, make the hazelnut gremolata, toast the hazelnuts on a baking sheet at 150°C/300°F for approx. 10 min. or until golden and fragrant. Let cool. Mince remaining garlic, parsley, and chives. Zest lemon and juice half the lemon. Roughly grind pink peppercorns in a food processor or mortar and pestle. Finely chop hazelnuts. Heat one third of the olive oil in a pan over medium-high heat and add the garlic and pink peppercorns. Swirl the pan and let cook for approx. 2 min. then transfer to a bowl. Add the lemon zest, hazelnuts, remaining olive oil, lemon juice, chopped parsley, and chives. Season to taste with salt, then add some more olive oil, if needed. Stir well. Once the pork is cooked, remove from the oven and the pot and slice. Strain the roasting pan juices through a sieve and reduce sauce in the saucepan over medium heat until thickened. To assemble the toasts, pile a portion of sliced pork on top of the toasted sourdough bread and drizzle with gravy. Finish with a spoonful of hazelnut gremolata. Enjoy!